Conqueror’s Blade is a medieval warfare multiplayer that features huge-scale siege battles where you command huge armies from the commander’s perspective. It’s got a new trailer out that shows just how demanding that’s going to be. The game looks a bit like For Honor filtered through the scale and insanity of a Dynasty Warriors title – or, better yet, the possibly-even-stranger Koei musou game Bladestorm: Nightmare. 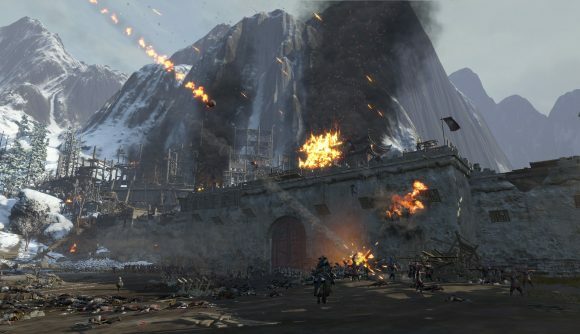 Players each take control of an army and either defend or attack a castle or fortress, commanding troops while dashing out to fight and pull of special moves and trying very hard not to get killed. The new trailer shows off a lot of the action, as well as the customization options you’ve got for your army. It’s a bit like watching a Total War battle from a boots-on-the-ground point of view, and if they’re able to pull it off, it should be an exciting experience. Rachel has been trying out the beta build of the game, and wrote about her thoughts last week. It’s still fairly chaotic, but she found that it occasionally produced awe-inspiring moments that reminded her of the Battle for Helm’s Deep in the Lord of of the Rings. I’m impressed with the number of troops on screen at once, and with the large-scale destruction that catapults seem capable of dishing out. As Rachel points out, it’s fairly often complete chaos, but that sounds to me pretty accurate for the time period. Conqueror’s Blade is coming out “soon,” according to its Steam page, but you can buy into beta access if you’re willing to shell out some cash up front. Be aware though that once it launches it’ll be free to play.